Many Nintendo fans experienced some technical difficulties today during the E3 Nintendo Direct broadcast. Many users weren't able to log on to Nintendo's official website to watch the broadcast and took to social media sites to vent their frustration. 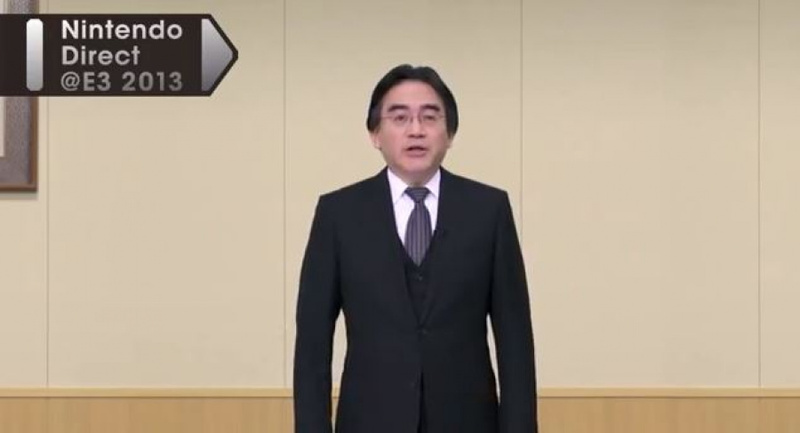 Hello everyone this is Satoru Iwata. Thank you all for watching the Nintendo Direct this morning. I understand that many of you experienced technical issues with the live stream. I apologize and thank you for your patience. We have a lot of exciting news that we would like to share with you. You can watch the entire Nintendo Direct @ E3 2013 here. Did any of our readers fail to catch any of today's Nintendo Direct? We've been covering all the biggest news from the broadcast, so stick with us. I appreciate how polite they can be compared to other companies. Nintendo Life went down for me for awhile. Went over to Nintendo Everything which was really laggy but let me see well enough. Yeah, had a hard time watching today. I missed then end but that is an awesome response to the fans! Don't apoligize for that, apologize for getting everyone pumped for the direct and then crapping out that rubbish. I can't stay mad with Nintendo. They are just too kind! I appreciate the apology. I expected a higher quality stream. The stream cutting out was indeed pretty bad, though. Totally killed my hype. At the end of the day, though, it's about the games, and I do believe there were great games there. I could see it all, although it lagged sometimes. At one point I had to switch to the low quality for it to be watchable. They should really switch from Ustream. I notice that whenever the videos have more than 500k viewers it starts to lag and glitch out. I appreciate his apology though. I basically slept zero hours last night, finally got up at 4:45 and waited for the ND at 7, had lag problems so bad I had to quit and wait for the presentation to show up on the eShop. Stuck around just long enough to see the worst Mario announcement the universe has ever known and proceeded to brood about it for the next hour. Then jumped on the eShop only to have the new Smash character spoiled before I could watch the trailer, then watched the whole conference to be unimpressed by almost everything and to have my soul completely crushed by the revelation that Retro's new game has been another Donkey Kong this whole time. I thought last year's E3 was the worst ever. But even though it was technically richer in content, nothing competes with the disappointment this year. I think a piece of my love for Nintendo has permanently broken off and turned to dust. Yeah the e3.nintendo website wasn't working, and Nintendo Life conked out a few seconds in. Luckily I found a working one about 5 minutes in. It was a laggy mess with a cut-off ending. Luckily, the whole thing was uploaded to youtube almost immediately. I couldn't access it from Nintendo's site at first, so came to Nintendo Life, but it was lagging like crazy, so I went back to Nintendo's site and got the stream there finally. It was still lagging like crazy, and then it suddenly went off air about 40 minutes in when it should have ended, but it wasn't at the end yet. I had to rewatch the entire thing on youtube after, and there was about 8 minutes that Nintendo had never bothered to stream at the end, I'm guessing because I was 8 minutes behind from all the lag when it actually ended. I see the technical difficulties as a good sign that interest is Nintendo is still alive. If people weren't interested, no one would be complaining because there would have been sufficient bandwidth for the handful watching. He has a lot more to apologise for than bad latency with the state of the Wii U for (at least) the next year. @DerpSandwich Your last paragraph,I couldn't have said it better myself.Never do I hate on Nintendo,not outside my own mind anyway but this was just appaling.The quality of the stream which was practically unwatchable really just summed it all up for me.Even the live updates and comments on here weren't working for me but they did for the other 2 conferences. It was lagging for me for about 15 minutes, so I missed quite a bit, then it suddenly jumped far ahead and played fine after that. Guys, stop complaining. Just because you weren't pleased doesn't mean that it was bad. It just means that you take things too hard and should probably just leave this planet because I hate knowing that there are human beings like you on this earth who have to complain about every single thing. So what if it was a little disappointing? You probably shouldn't have been looking for news on every single thing that was new. It's like going really deep and finding out everything X & Y have, then being let down when you play it. You destroy your own surprise factor. A very rare and welcome quality from someone in a position such as his. I almost threw my laptop out the window then I had several friends tell me the same thing that they were lagging, to be honest it hurt me at first, but I still watched the entire stream and then I watched it when it was uploaded on Youtube. However, the official website worked fine for me. You pretty much had to use 240p though, kinda diminished the impact of the trailers. Still, I'm really glad that Iwata even apologises about these problems. It's nice to know that he cares about us. i tried watching it on NL, but that didnt work, so i had to watch it on the Nintendo Direct site. I had no problems watching the steam here but others did elsewhere. I don't know why they didn't anticipate this considering there have been issues with the streams in past Nintendo Directs. @2Sang Not at all. I respect each company equally. Personally I think the PC is the better than consoles, buuut, first party games are what I want. I will say that the Direct was lacking in a lot of things, but I'm not going to make a fuss and cry foul. I'm more civilized. YES and the Pokemon Direct is at 9pm ET so Lets hope at 4pm ET Nintendo will have a longer conference i don't think Reggie and miyamoto-san are there for nothing. I haven't seen the entire Nintendo Direct...I HAVE seen all the trailer shown at it, though! I will be watching the entire thing in a few minutes, maybe hours. Iwata, you are probably one of the best CEOs ever. Thanks for the apology, even though I didn't watch it live. By the way, his English was really good throughout the whole Direct! It could've been on their youtube as a live feed, or not make it live at all. Thanks for the apology, Mr. Iwata. I really did enjoy the direct after seeing the individual videos here on Nintendo Life. Good show. I tried 3 sites, the lag was terrible so I watched the sony show instead, by then the ND was on youtube. They need to think of something better. Watched it off my 3DS had no problems what so ever.. and loved it.. got me more excited than I thought.. I now want a Wii U.. for Mario Kart 8, Wonderful 101, and the new Mario App.. 2 of the three which is very hard to impress me with.. I have not been this excited in years.. I seem to be the only person in the country who didn't have major issues. I stuttered a bit at the start and conked out about half-way through (nothing refreshing the page couldn't fix), but besides that it worked fine. I ended up missing the first half of it or so, and was finally able to watch the rest in stuttering 240p. . .And then I re-watched the whole thing on YouTube. Issues aside, Mario Kart and 3D World look awesome. I love the idea of the cat powerup, and playing as Peach as well. Hopefully we can use the extra characters without multiplayer. Sony and/or Microsoft workers and/or fans must have hacked the stream to try and upstage Nintendo! In all seriousness, I think it's great that Iwata-sama took the time to apologise. It really says a lot about Nintendo as a company, which makes me happy that I've stuck with them over the years. I was thinking it was just my computer during the time, until i logged into NL's E3 thread to see everybody complaining about it. It stalled every 4 seconds, then zapped seconds ahead or basically trimmed out a lot of footage making the entire Direct feel half as short and ridiculously butchered. no wonder it felt lacking and so abrupt, i can't judge until i rewatch it again. But as is, it was a messy disaster. @WaveBoy Haha yea it's a fair bit better the second time round. At least they are polite. Cheer up Iwata. So you have a couple of buffering issues (i think since i never saw the stream, well i did but only for a couple of mins). That stream still flowed smoothly. Cause well, it could've been worse. You got to respect the mans character. The stream was fine for the most part.